Browse our inventory of Magnum canvas tents for an array of family tents that can accommodate large camping groups. These large family tents fit in almost any environment and can hold up to eight cots. Some of the features of Magnum canvas tents include screen doors, large windows, private rooms, aluminum frames and double-stitched seams. Not only are Magnum canvas tents easy and quick to set up, but they are also strong, durable, waterproof and resistant to the harshest weather conditions. And don't forget, all of our Magnum canvas tents, like every product we sell, come with a 30-day 100% money-guarantee, so you can buy with confidence. Took it out on a January scout campout. Easy set-up. Kept us dry. Snowed 12 inches through the night. Dried out fast. Only drawback is the door zippers are one sided. Wonder why they did that. Magnum Tents is the manufacturer of heavy duty canvas wall tents designed to keep you out of the elements while hunting and camping. We are the only manufacturer that uses a 12oz preshrunk army duck canvas as standard material in our wall tents. This canvas is fire retardant and water/mildew resistant. The heavy weight adds to the durability and adds insulation during those cold nights. 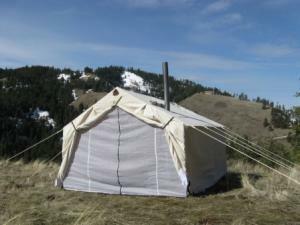 In addition, our Magnum wall tents contain just about every feature that you might need in a wall tent. These features are normally options that cost hundreds of extra dollars from other manufacturers.